The Magna Cube was another great surprise for me, also from Puzzle Guru. The other one was the Houdini Dead Lock, reviewed last week. It is also part of the IQ Collection from the Family Games America, together with the Mosaic and the Labyrinth 4D, both seem very interesting as well. 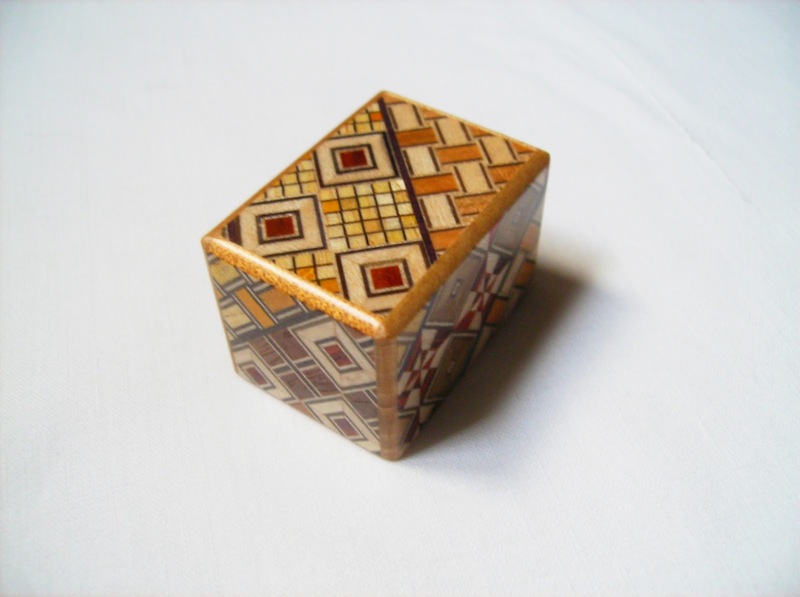 This puzzle is like a Soma Cube with a "Twist". 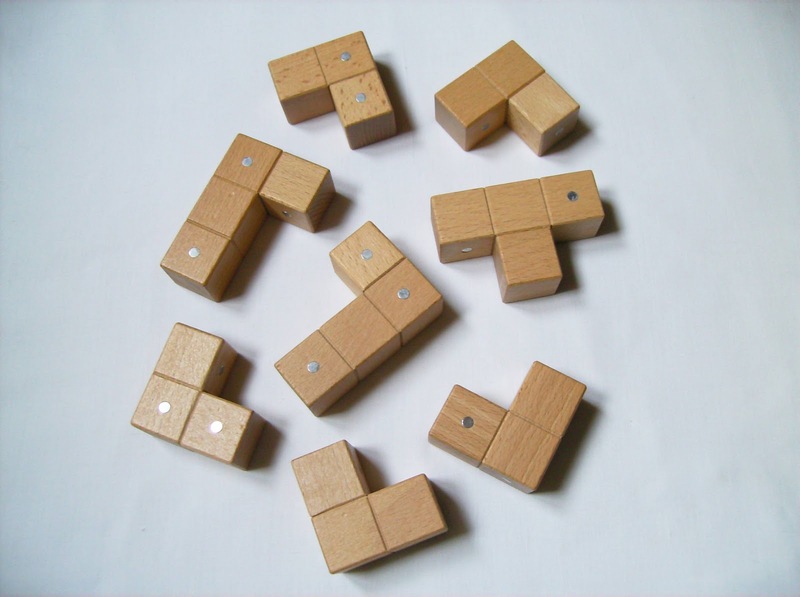 The added difficulty comes from the twenty four strategically placed magnets into the eight wooden pieces that form a 3x3 cube. 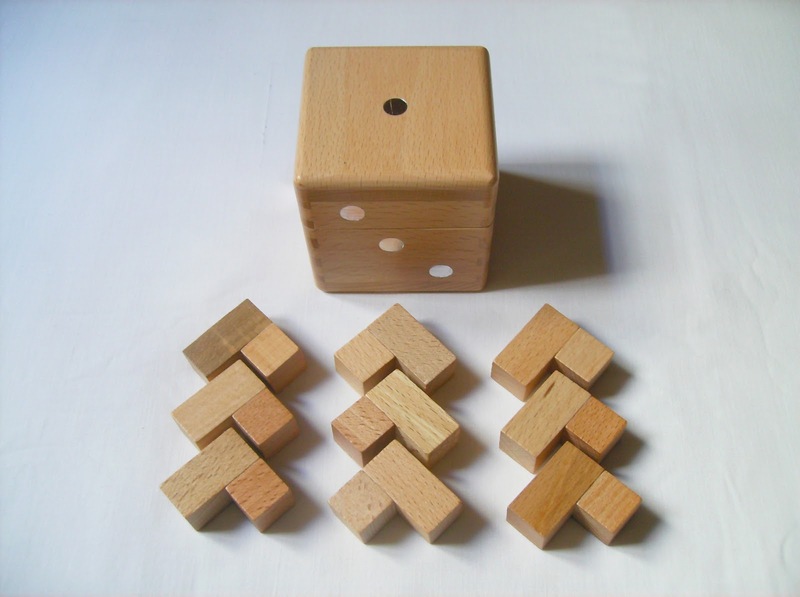 Each piece can have either two, three or four magnets scattered around, although only one has two and another one four, leaving all the other six pieces with three magnets each. 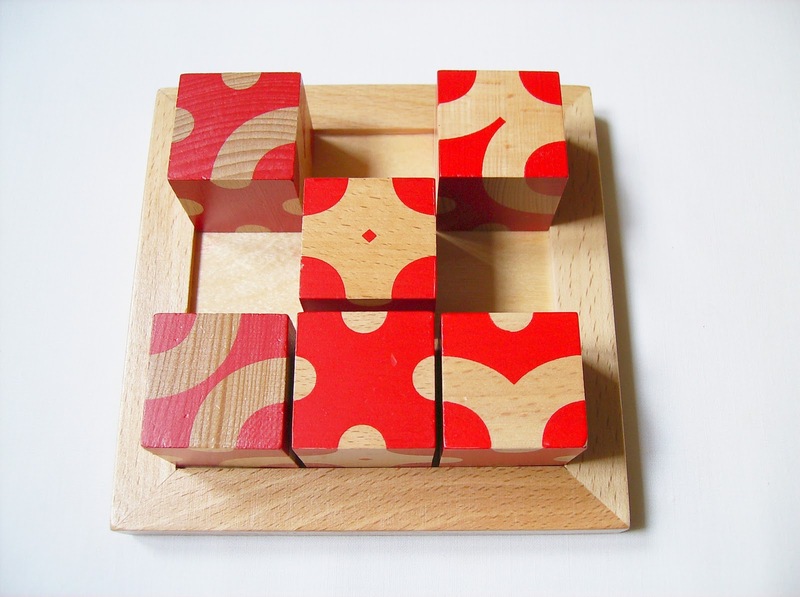 The tricky part is that each magnet will either repel or attract with another piece, thus making the puzzle much more difficult to solve. 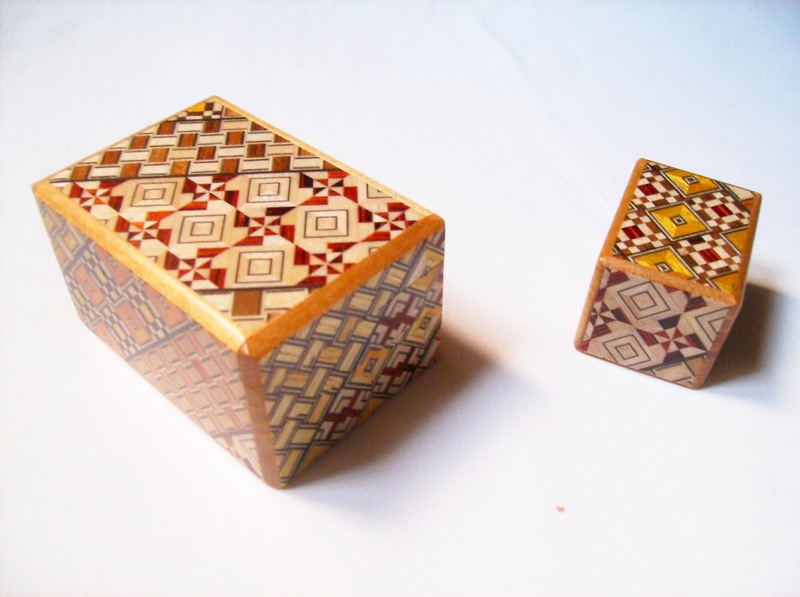 Since 1933, we've seen many puzzle variations inspired by Piet Hein's seven piece Soma Cube, although some of them stand out more than others. One of the most popular is the Bedlam Cube with its thirteen pieces, but the Magna Cube is also a very nice change from the old formula and can be considered one of the best so far. 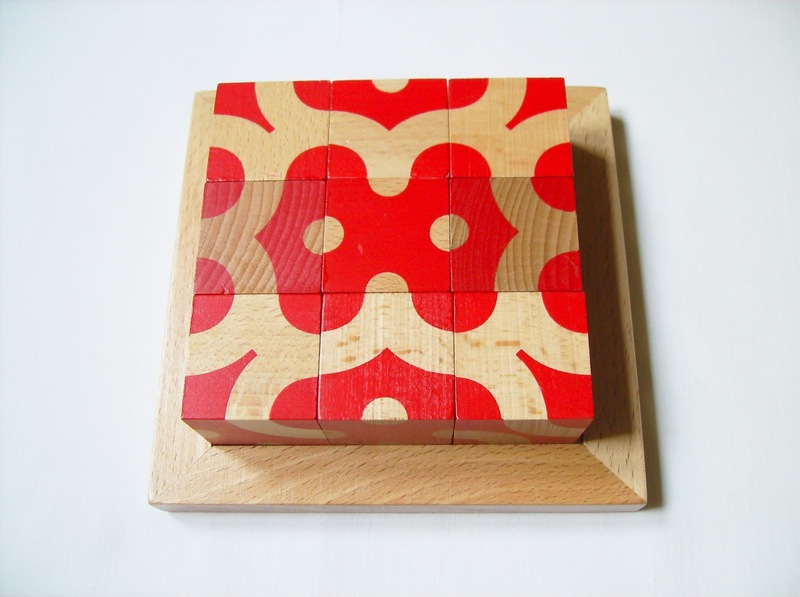 The puzzle is beautifully presented with a harder tone wooden stand, to better displayed it when solved. I say solved, because there's no way you can keep it in the stand, unless it's all tight packed correctly, otherwise you're gonna have falling pieces. 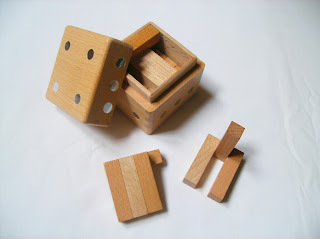 After you take the cube apart and shuffle the pieces, you have a serious challenge on your hands. Although it's not as hard as a Bedlam Cube, it does take a little patience to see some progress. 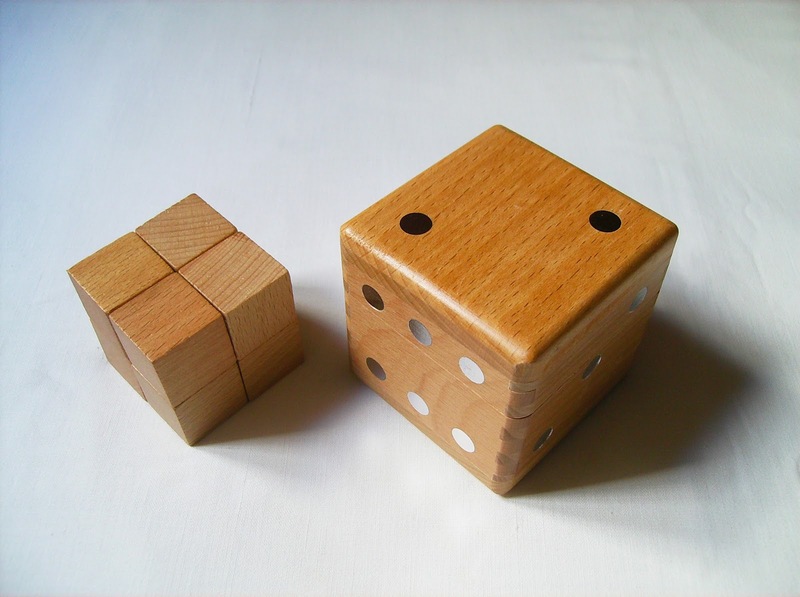 One of the requirements to solve it right is that no magnet can be visible outside of the cube. It seems only logic, but there's going to be countless times when you think you're in the right path, to only notice one or two magnets seen on the outer side. Another requirement to keep in mind is that each magnet has to be connected to another one. In other words, you can't have two magnets of a particular piece connected and leave another one loose without a counterpart on another piece. Once more, this will give to the puzzle an added level of complexity, making sure to leave you with a small headache. One thing that it does make the puzzle a bit more easy, is that the cube only has three types of pieces (graphical representations can be done with a small 'v', an 'L' and a 'T'): 5 v's, 2 L's and a T. Knowing this, it simplifies when you need a 'v', for example, but the magnet configuration doesn't fit with the rest of the placed pieces. Then, you just need to replace that piece with the one that has the magnets in the right position. Looking at the puzzle like this, knowing the two main requirements and taking advantage of the fact that it only has three types of pieces, you only need some experimentation with a couple of pieces and work your way up to form the cube. I'm not sure of the exact number of solutions, but I reckon it must be a very small number, given the restrictions and requirements needed to solve it. Having played with several other Soma related puzzles, I can honestly say that this one is among my favorites, alongside the Bedlam Cube. Not only for its great presentation with the stand, but also for the challenge and the novelty of seeing something different with magnets. It can be a little time consuming though, depending on your puzzle solving skills, but then again, you'll have your money's worth. The Magna Cube can be purchased at Puzzle Guru, as well as the others in the IQ Collection: The Mosaic and the Labyrinth 4D. There's something about hidden mechanism puzzles that I find very appealing. 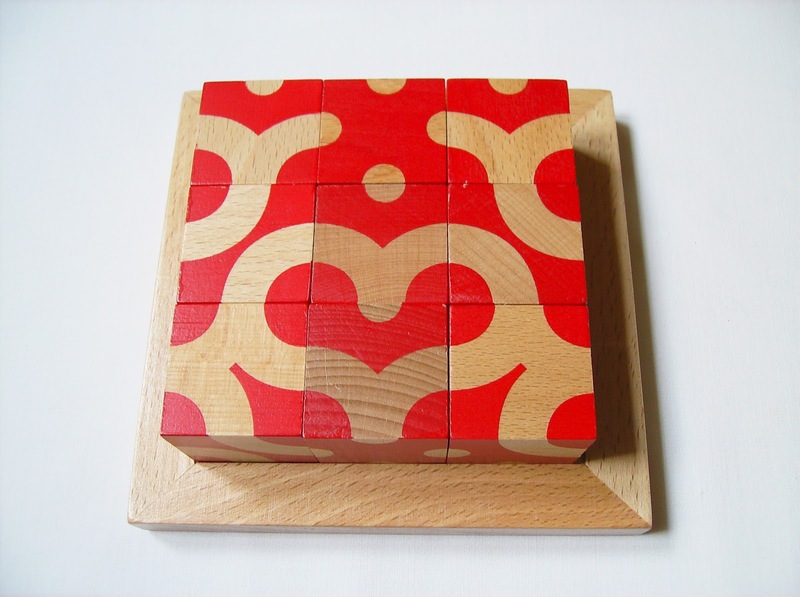 The challenge of finding the secret that keeps the pieces connected and interlocked is somewhat rewarding, always leaving you with that a-ha moment when the solution is discovered. 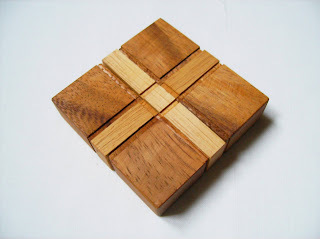 The Cross Puzzle, by Bits and Pieces is one of such puzzles. 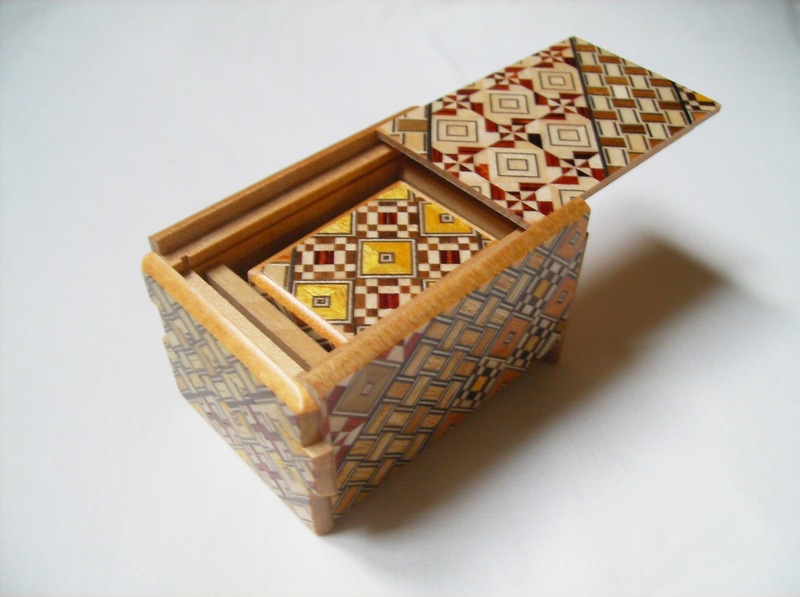 Beautifully designed, resembling a gift-wrapped package, your objective is to separate the two pieces that comprise the puzzle. Now, if you're like me and already solved the 'X Marks the Spot' and/or the 'Cast News' by Nobuyuki Yoshigahara, you're in luck. 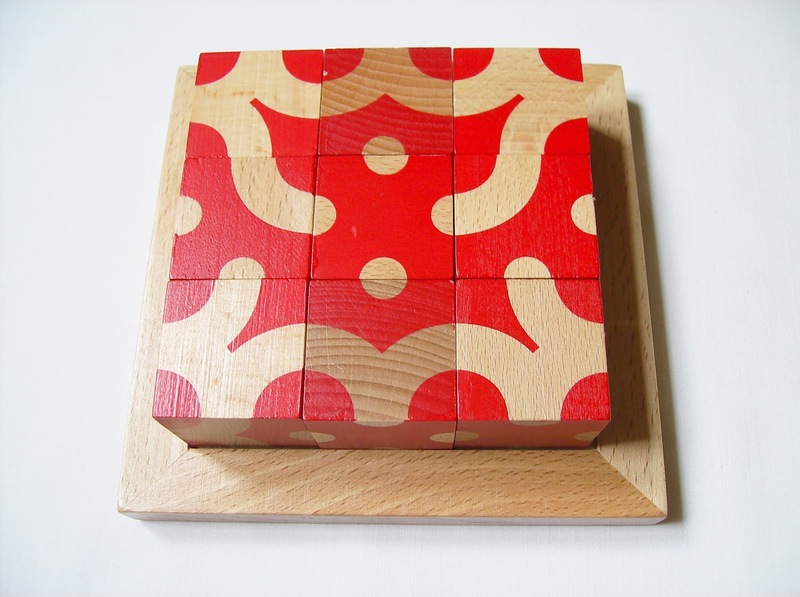 The concept and principle behind the puzzle is very similar to those and you'll solve it pretty quickly. If, on the contrary, you're unfamiliar with the mechanism, it can be quite tricky to solve. 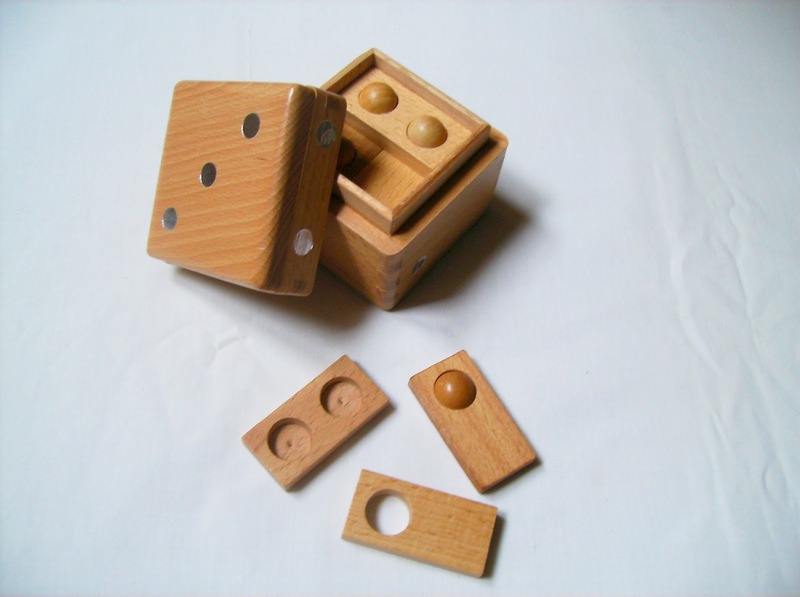 A close inspection will reveal that, when shaken, the puzzle makes a rattling sound, giving away that the solution is related to this particularity. Others things you might notice is how the two pieces are joined together and the way they are locked at the middle. Since both pieces are not that tight, you can see a little of what's going on inside. Adding how the mechanism in the middle works with that rattling inside, I'm sure it won't be that hard to solve after that. Even if you understand how to separate the pieces, it could be a bit frustrating getting the internal parts to clear the way. An easier way to do this (Spoiler ahead) is to get the puzzle to spin fast in a hard surface (like you would make a coin spin). The centrifugal force will send the internal pins to the edges, leaving the middle free. Just lift one of the pieces and there you go, the puzzle is solved. For a graphical solution click here. The difficulty of the Cross Puzzle is rated by PuzzleMaster as a 6/10, although the Cast News, with the same mechanism is a 10/10. The only reason I can see why is because the cast puzzle has the pieces much more tight together, giving away very little information regarding its solution. The rattling is there though, and the same solution can also be applied. In general, the Cross Puzzle is a very nice puzzle. Light and small (7 cm/2.75"), it can also be categorized as a trick puzzle, because the solution can be interpreted as some kind of a trick, not a series of movements. When I first saw it, I didn't know that it was similar to the above mentioned puzzles, but it's another neat way of presenting a known concept. 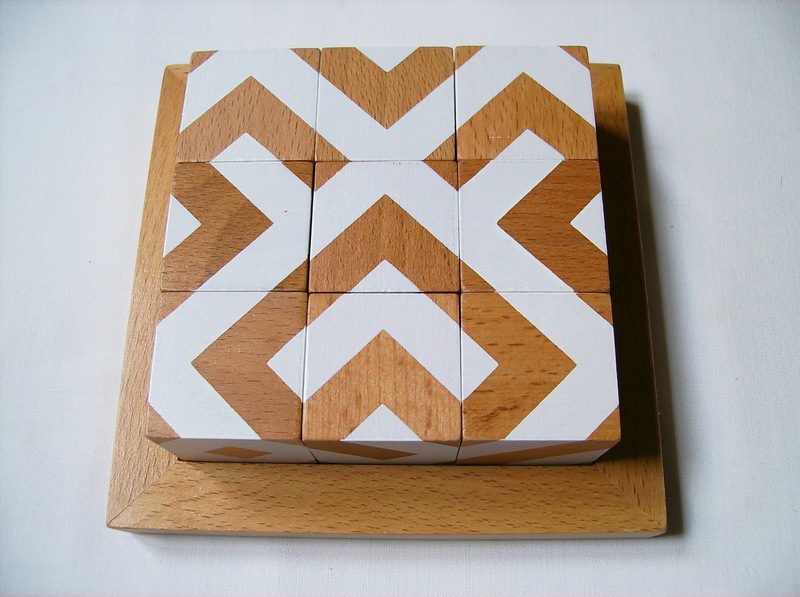 The Cross Puzzle puzzle came from PuzzleMaster, but it's currently sold out though. If you're interested, check back later or drop an e-mail to the customer's service asking for an expected date. 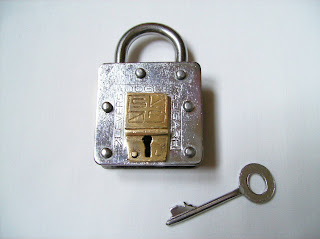 I've reviewed two Trick Locks before (see here and here), but the Houdini Dead Lock is my favorite so far. It's part of 3 Puzzle Lock series from Professor Puzzle and this one is level 3, which is the hardest. The small collection can be found at Puzzle Guru in the UK. Since I started my collection, I've been fascinated by Puzzle Locks. They have all this mystery and enigma around them that built up from centuries ago, when they first started appearing. They can be quite unique and even after you've opened a few of them, the next one will leave you, for sure just as much intrigued as the previous ones. What makes each Puzzle Lock unique is the way or "trick" that you need to figure out to open them. 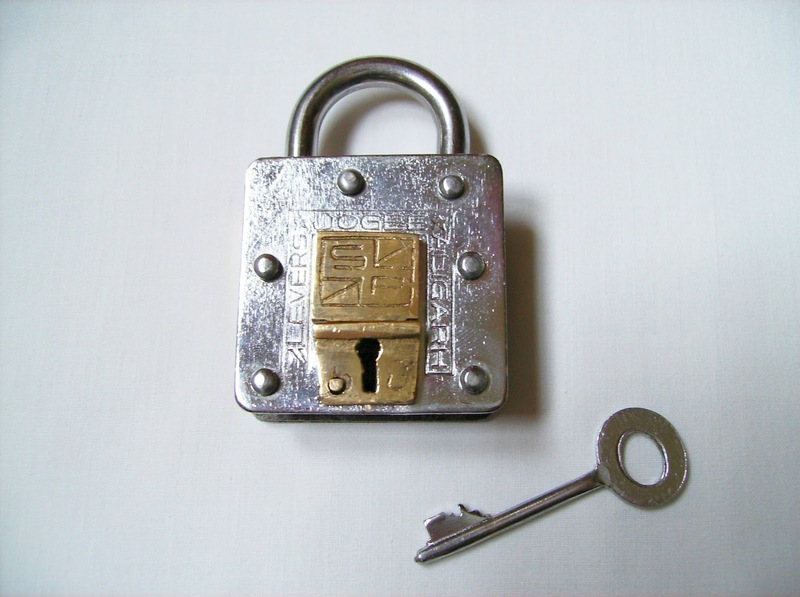 Some of these locks might not even require a key to open, having an internal mechanism with one or more necessary secret moves, to unlock them. 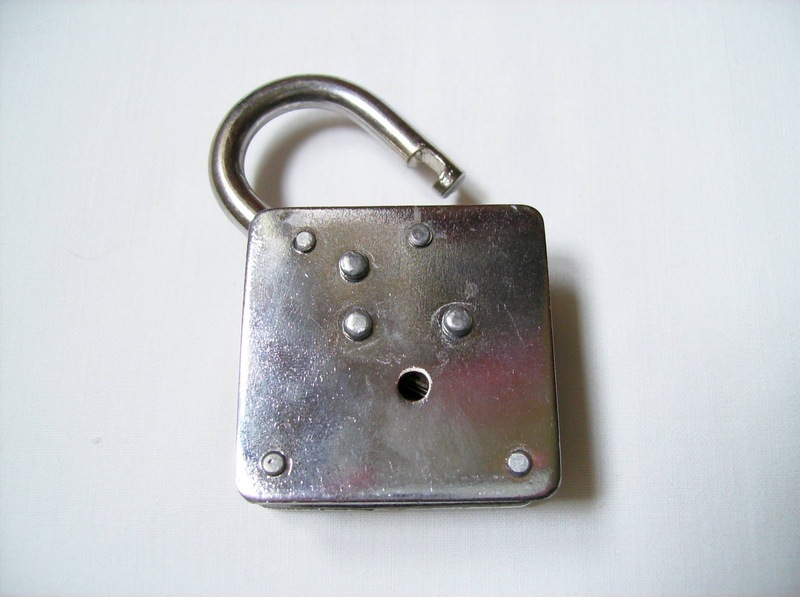 It is said that Harry Houdini might have used these locks in his escapes, but until today there's no proof of that. The Houdini Dead Lock, manages to make use of these tricks in a very clever way. I've spent a good half hour with it, trying in vain every possible key position you can think of. The "key" here is to pay attention to every detail about the puzzle, because not everything is quite exactly what it looks like and can also be very deceptive. One thing you might notice about the lock is the part above the key hole. If you try to move it, it won't budge that much, except for a push from the left, but that will not get you anywhere either. 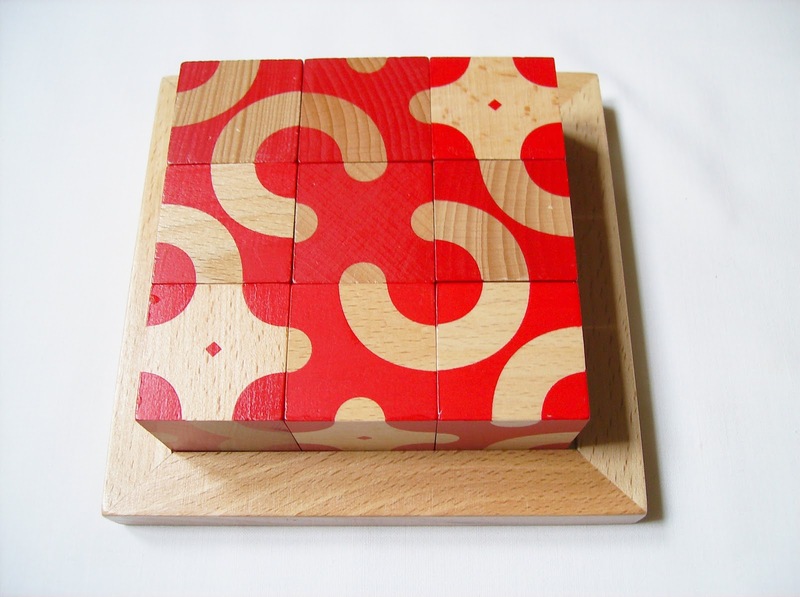 To avoid spoiling your experience with the puzzle, I won't reveal the exact way to open it, which unlike other puzzles, once you know the solution, there's no reason to attempt solving it again. What I can do is give you a small hint (Spoiler ahead): The key can also be used in another way, other than using it in the key hole. If you're already frustrated enough and for some reason gave up, you can see a solution video in the product's page at Puzzle Guru. As I mentioned above, this is my favorite from the Trick Locks I have currently in my collection. Right now, I only own this one in the Houdini series, but I reckon I've made the right choice. It's a nice challenge, not crazy hard, but also nothing that easy you can solve in a couple of minutes. I also like the fact that it's quite hefty and good quality, definitely not something made with cheap materials. If you haven't yet tried a Trick Lock, I strongly recommend one of this series to start. Puzzle Guru stocks all three and they're all the same price, so it's up to you to choose your level of frustration. 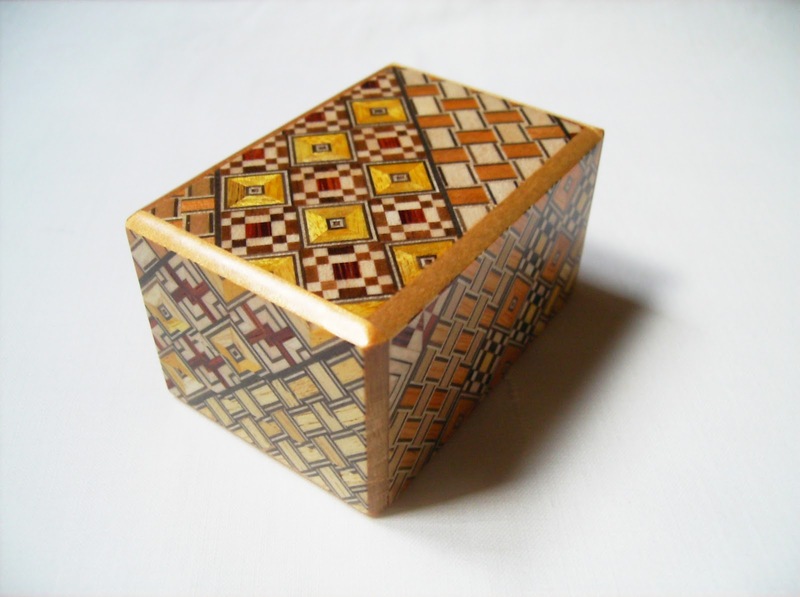 Oskar van Deventer has invented so many puzzles over the last thirty years that he could fill up a museum with all of his creations. The one that I'm reviewing today is another great design by him, which consists of four mazes that need to be solved simultaneously. 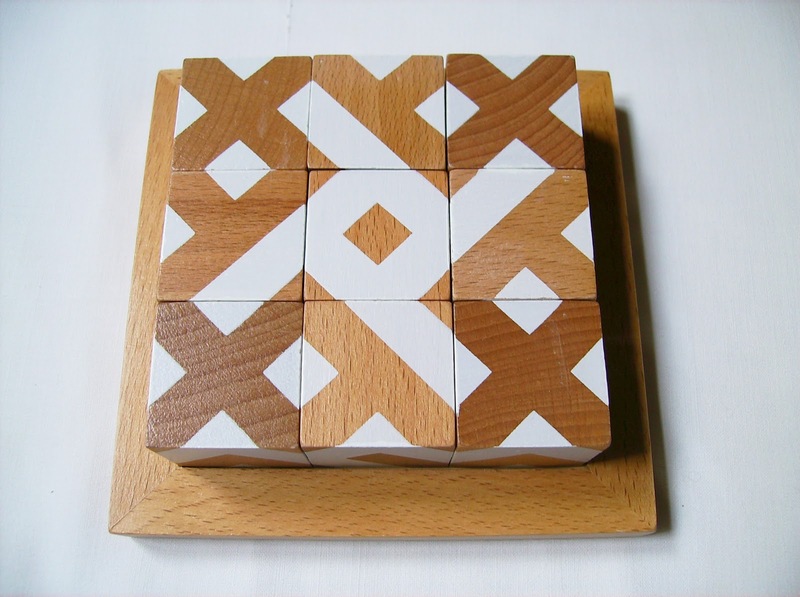 The Medallion (originally called Four D), was initially made by George Miller in acrylic and was Oskar's exchange puzzle at the 23rd annual IPP (International Puzzle Party). 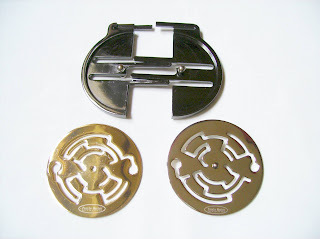 It was later picked by Hanayama for mass-production and is now sold at PuzzleMaster. 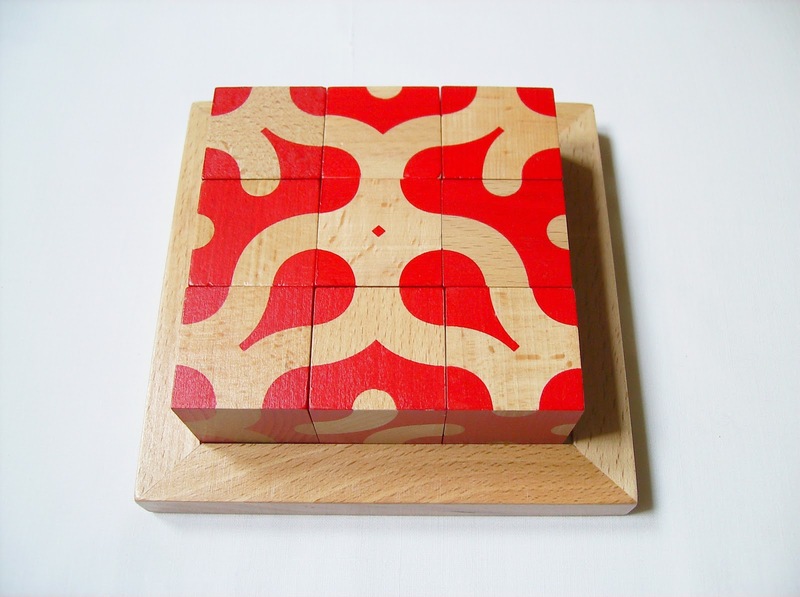 The puzzle bears a slight resemblance to another one of Oskar's designs, the Cast L'œuf, comprised of two separate parts with distinct mazes to navigate, although I consider the Medallion much harder. 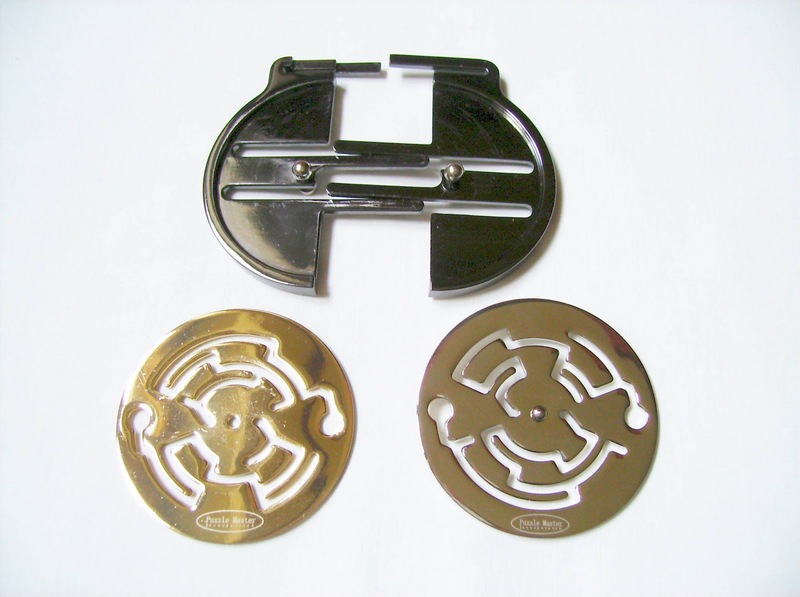 Built with a beautiful chrome finish and resembling a gold medal, the Medallion challenges you to solve four mazes at the same time. There's a golden disc with two mazes on the front of the puzzle and a silver one on the back. 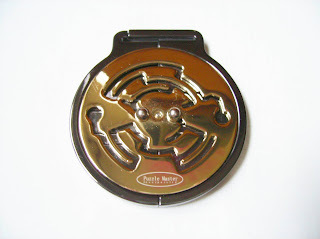 To guide the two pins through the mazes, you have to rotate the disks back and forth in order to achieve the 55 steps needed to take the puzzle apart. For that you need to work with the two discs in sync. 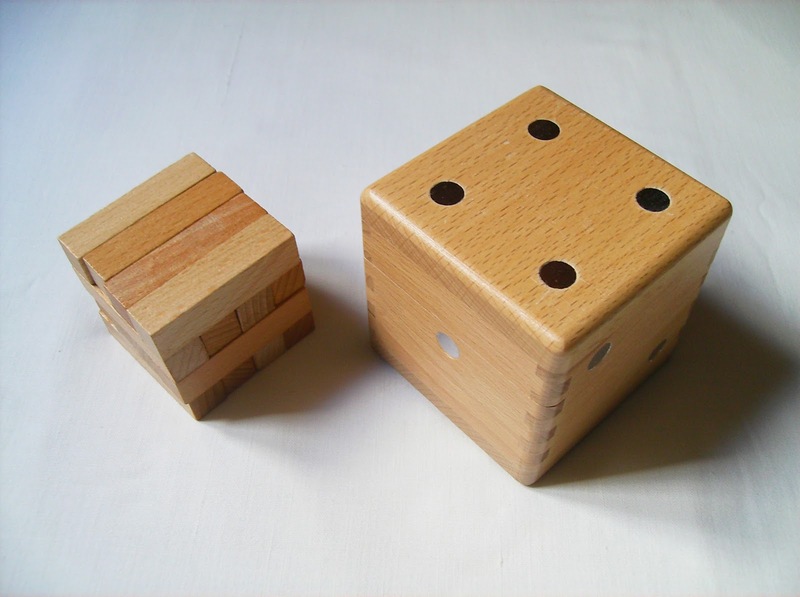 To complicate matters worse, the two discs have different mazes on them, so what you do in one, may allow or block your next moves. With this in mind, you need to think ahead to make sure every step has a follow up on the other side. Also, be aware that the path taken won't be one way only, meaning that, at times you may feel that you're close to the end, but you have to go back a little to unlock the other side of the maze. Having solved so many Oskar's puzzles by now, I was eager to try yet another one of his tough creations and as usual, it didn't disappointed me. You always have this sense of accomplishment after solving a hard puzzle and you don't feel that you just wasted your time. 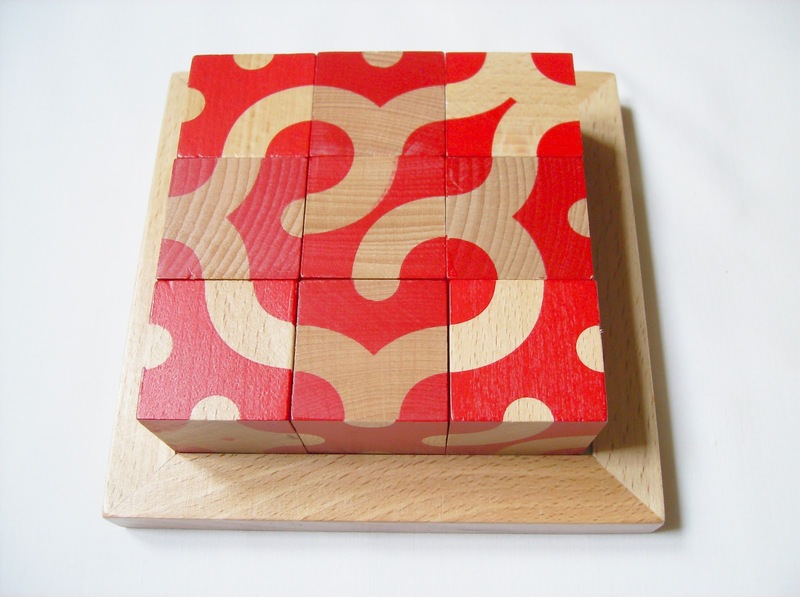 It's a great high quality puzzle, very well built, like all of Hanayama's puzzles, and I recommend it to anyone in search of a demanding challenge. The Medallion is available at PuzzleMaster for $19.99 CAD (approx. €14.20). For a detailed solution guide, click here. 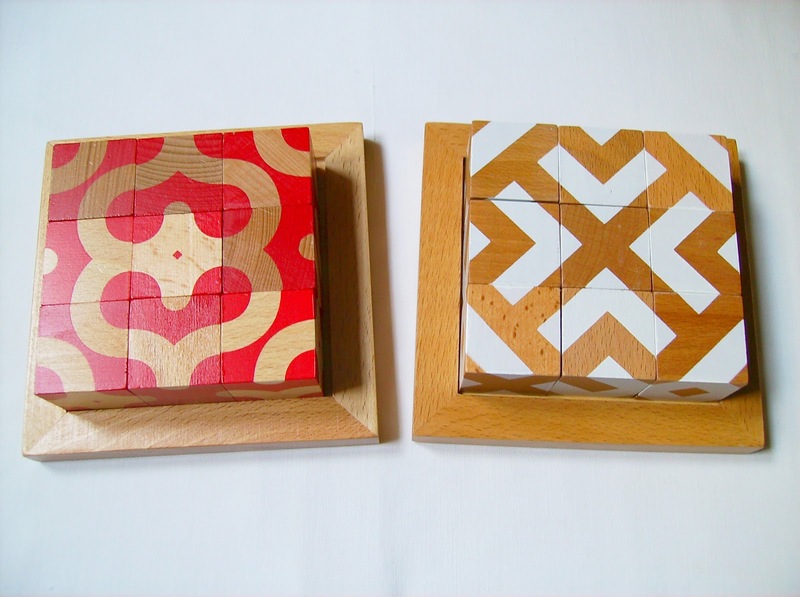 I found these nice puzzles very recently and was immediately drawn to them. 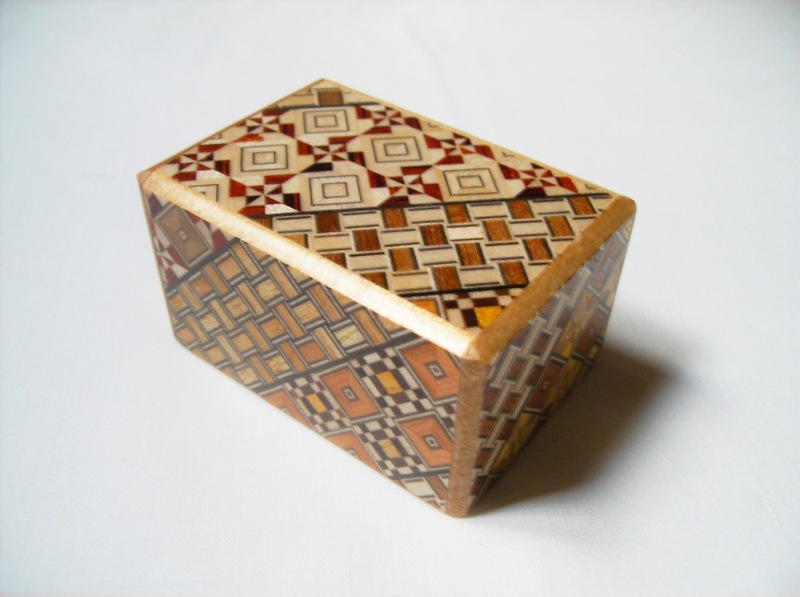 The mesmerizing patterns you can create with the cubes are endless and they can be extremely addictive. 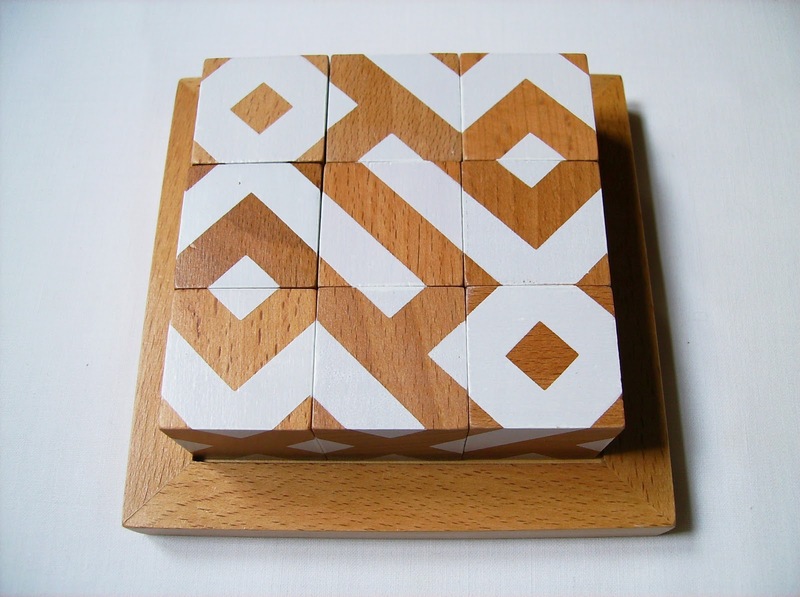 Created by Pablo Cha from Uruguay, the Motif Cubes (also known as Nueve Cubes) are made from red birch hardwood and come in two different designs, red and white. There's no special goal for the puzzles. 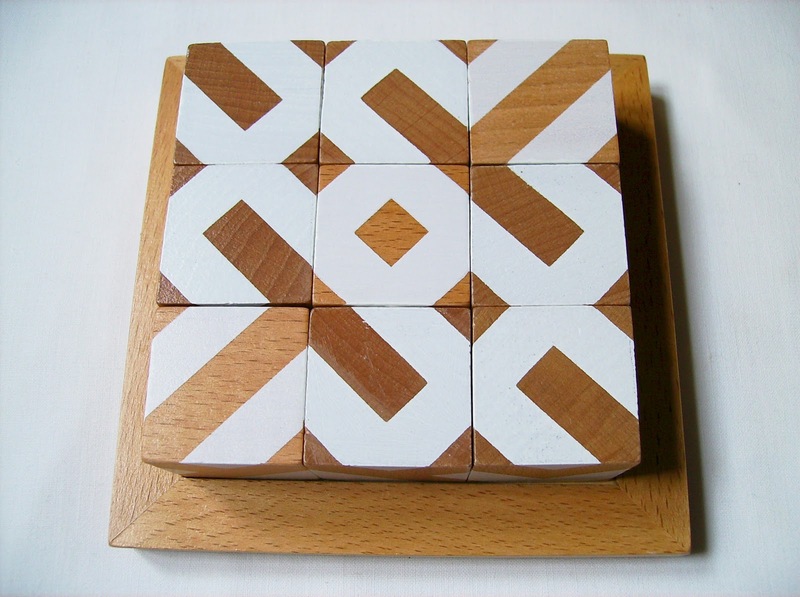 You are presented with nine blocks in a nice wooden base, where each one has six different designs. 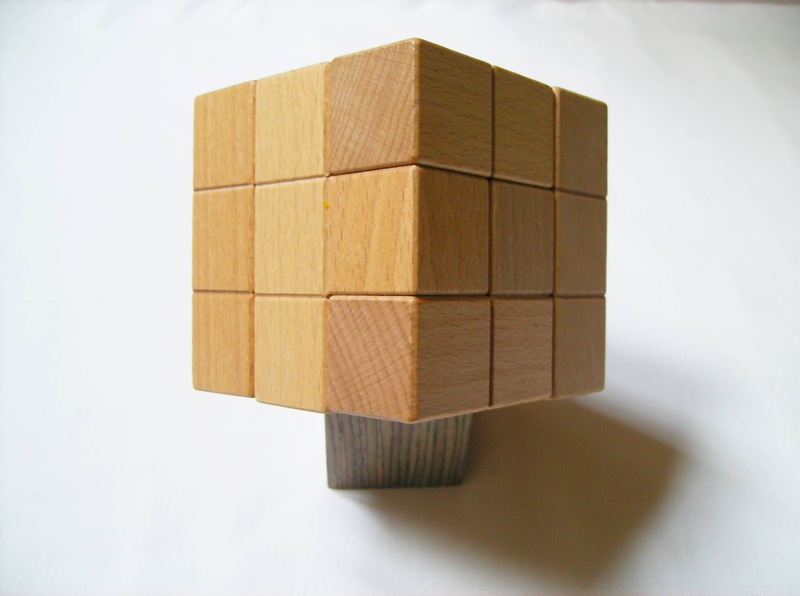 Each cube measures 3.4 cm (1.34") and the base is 13.8 cm (5.43"). Your task is to simply arrange the cubes and form a unique pattern. 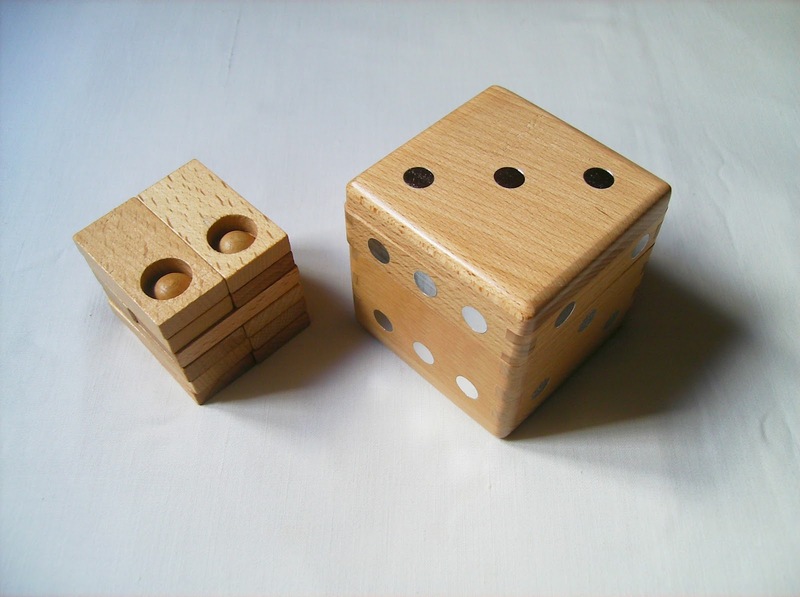 There are billions of possible combinations (68,719,476,736 to be exact), although not all of them will yield a fancy pattern, as some of them will probably result in a senseless design. It's up to you and your creativity to come up with all kinds of patterns. They don't exactly need to be symmetrical, as long as it makes sense to you. 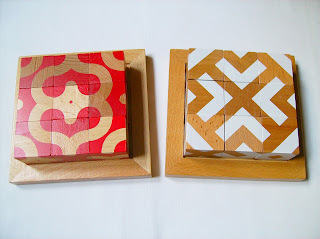 Both Red and White Motifs are essentially similar, with the only difference being in the way the designs were painted on the blocks. One is curvier and the other one uses straight lines. Personally, I prefer the red pattern, because of the more graceful and classier designs it can create, but on the other hand, I like the white color better, as in my opinion presents a nicer contrast with the white and almost golden color of the wood. Because of this indecision of which one would be better to purchase, I bought both. This way, I get the best of both worlds. 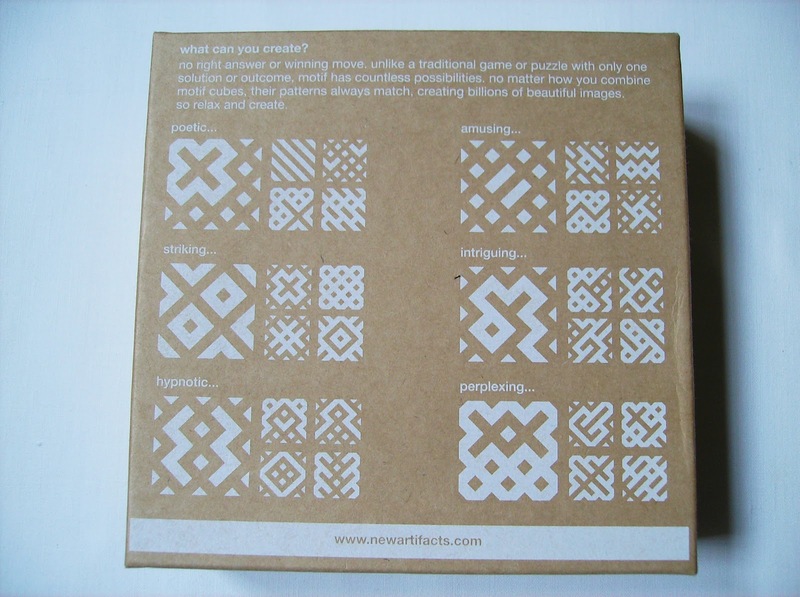 The Motif Cubes were a very nice surprise. Simple, but beautiful, easy to do and yet so addictive and relaxing. There are so many possible designs that you'll always create something new, so it will be long before you're done with them. They're the perfect object for a work desk, especially when you're in need of killing some time or just plain bored. Although there's a minor flaw here and there in the wood color, don't let that stop you from having a good and enjoyable time. 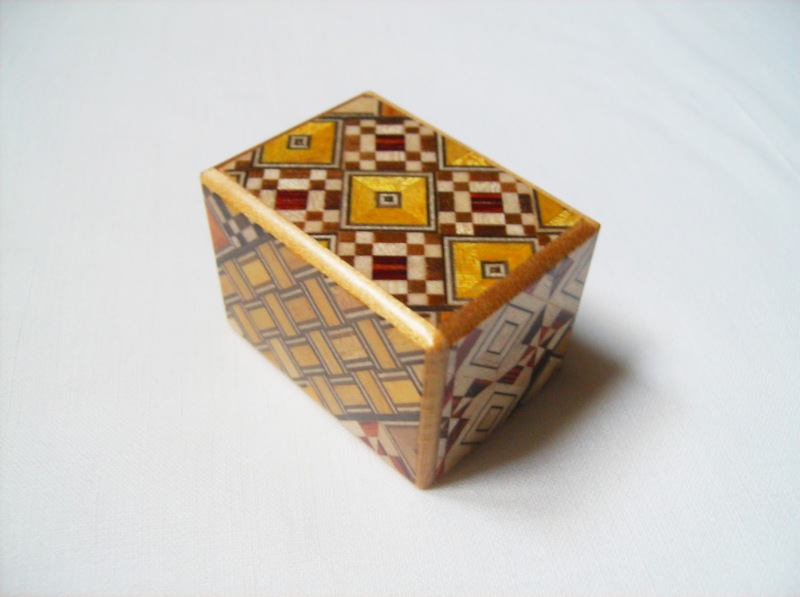 I bought the Motif Cubes from the Birdkids' website (Red and White), but they also have an eBay Store if you prefer buying from there. Added Note: If you're unable to find inspiration, just turn to bottom of the box and you'll find there some very nice patterns to stimulate your creativity... And to complicate things just a little bit, there's no visible edges of the individual blocks in the designs, so it's more difficult to recognize which cubes are needed to match the pattern you're seeing. 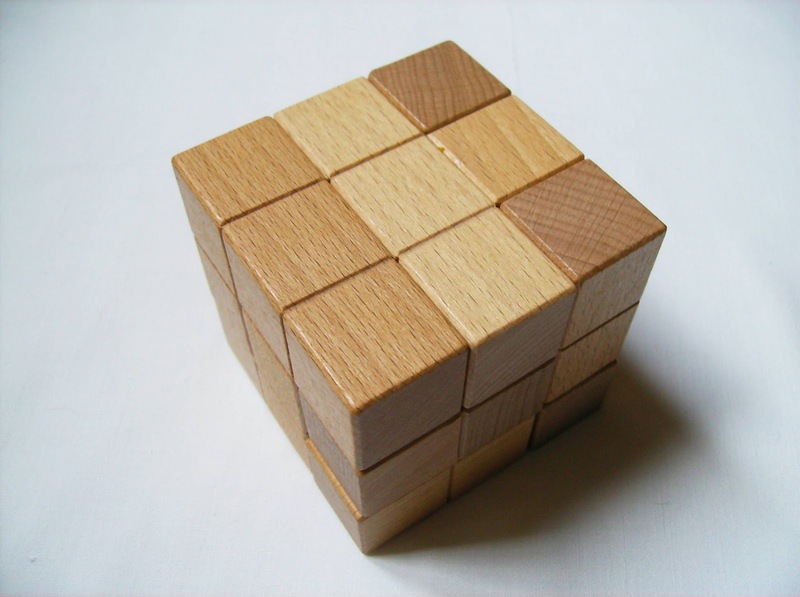 It's an added challenge and a different way to tackle the puzzle. After a few months of hiatus, I'm back with more puzzle reviews... And there's nothing better than return with a great set of puzzles, the Dice Box Series. This is a collection of six Assembly puzzles designed and produced by MI-Toys, which is based in China and founded in 1992. 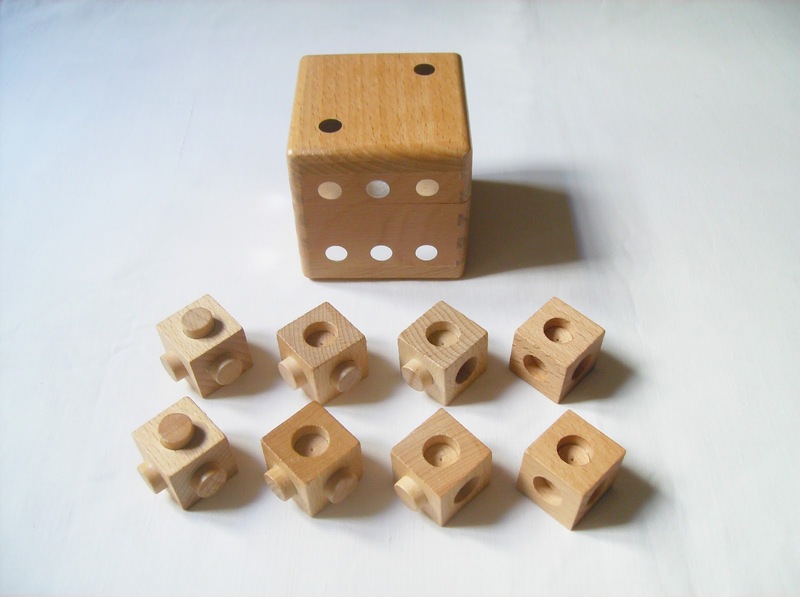 The design of the puzzles is very elegant, with six polished wooden boxes, each depicting a real dotted dice. 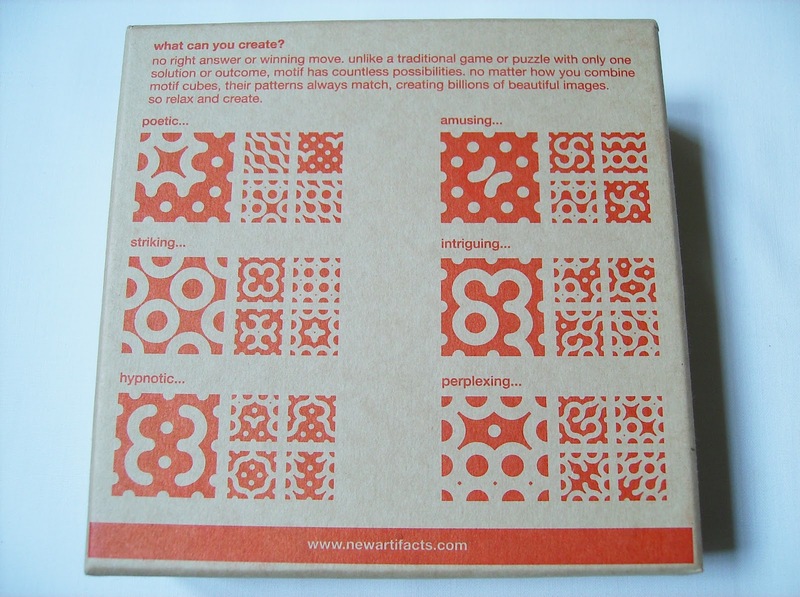 Each box has its own corresponding number with silver dots from 1 to 6 on the lid, so you'll know what puzzle's inside. They range in difficulty from * - one star (easy) to **** - four stars (genius). 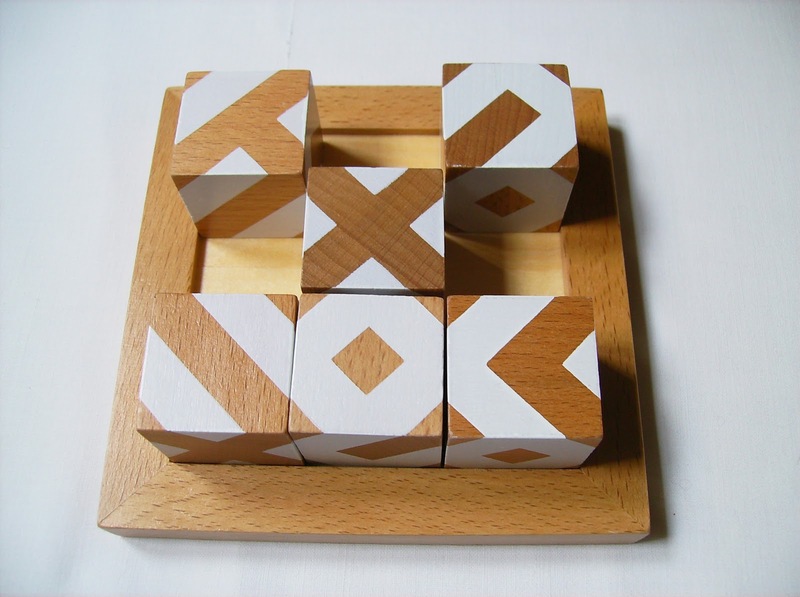 Oddly, none of the six puzzles has a difficulty of one star, leaving only three possible levels: three boxes have ** - Difficult; two boxes have *** - Unbelievable and there's only one with **** - Genius. 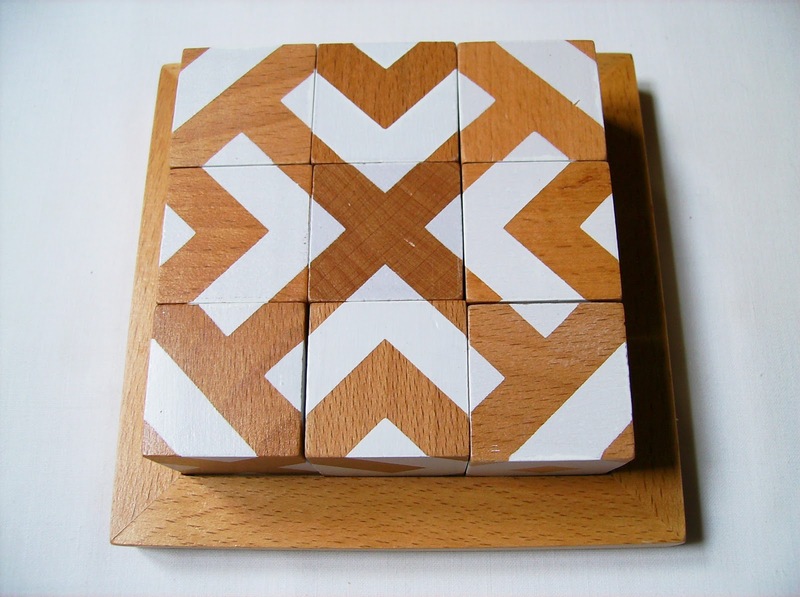 This puzzle has nine identical pieces, all with an area of 2x2 squares. 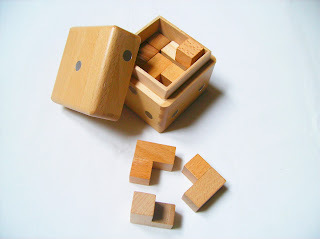 The goal is similar to the classic Soma Cube, which is to take out all the pieces inside the box, scramble them up and form a cube so that they fit inside the box, allowing the lid to close. Also with difficulty **, I think this one should've been classified with * - Easy, as I found it to be the easiest one in the series. 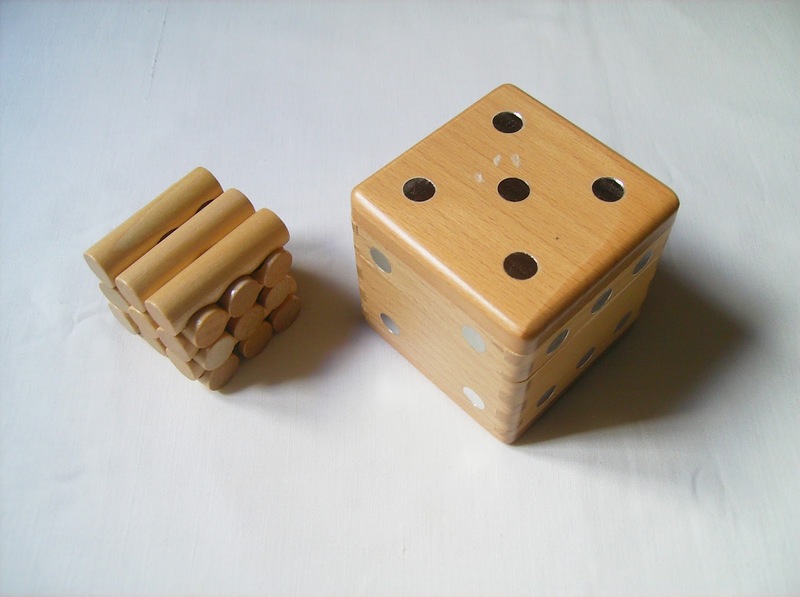 You have eight cubes that when correctly connected, they form a large cube. 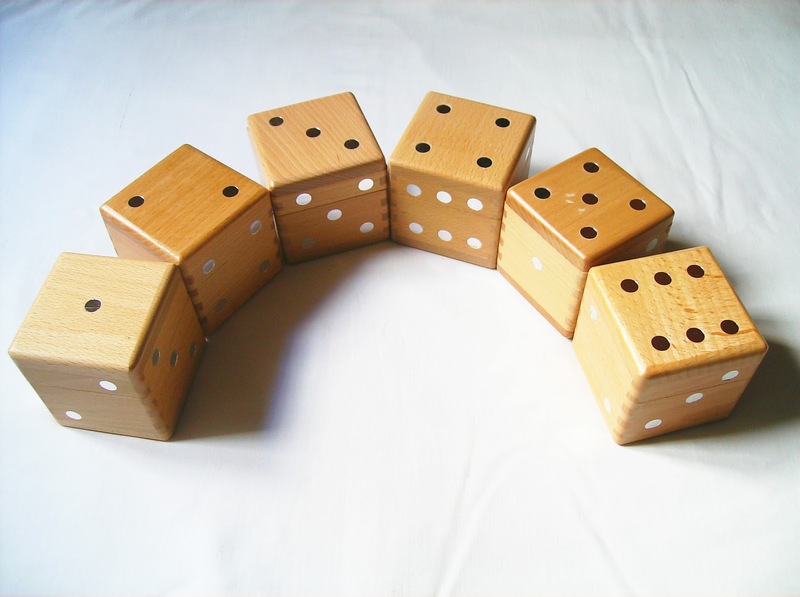 Each little cube has three adjacent faces that can have pins or holes and the other three faces are all flat. 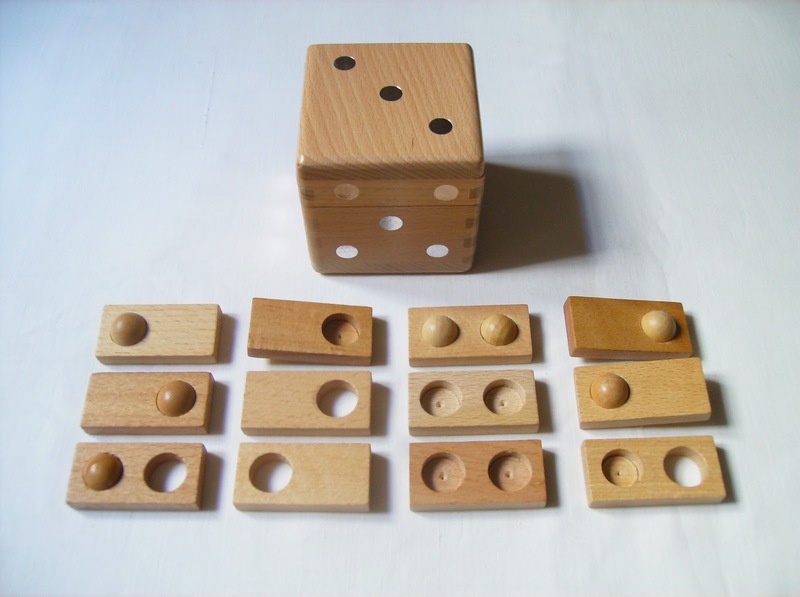 They can be divided into four groups of two pieces with the same configuration: two with three pins; two pins and one hole; one pin and two holes and finally two pieces with three adjacent holes. With the pieces all carefully separated into these four groups, you can easily solve it, always bearing in mind that the three flat adjacent faces point outwards, thus making a perfect cube. 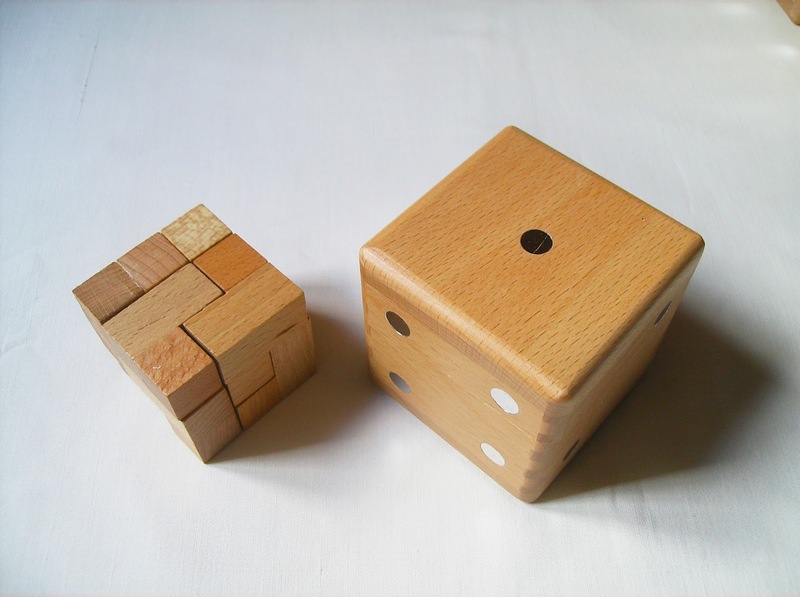 A nice way to make this puzzle harder could be, to have a 3x3 cube with nine pieces, instead of a 2x2 one. Probably the resulting pieces would've been too small and hard to manipulate, judging by the size of the box (7x7x7 cm). Perhaps an idea to consider by a craftsman, for some other puzzle. 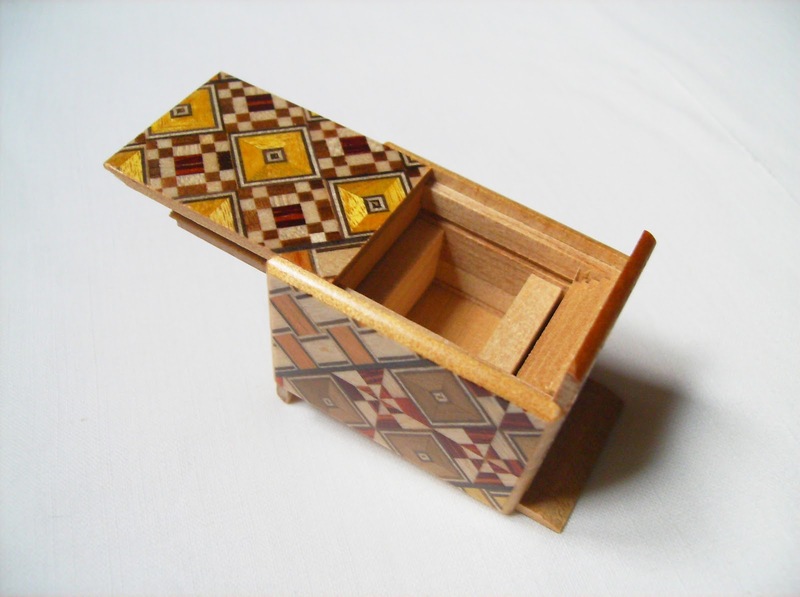 This is the third and last Dice Box with a difficulty of **, although I consider this one the hardest of the three. You're given twelve rectangular pieces, each having a combination of two out of three possibilities: a semi-sphere, a hole or an indentation, giving you a total of eight different configurations. Some pieces can have one or two of the same possibilities, adding some level of complexity. Solving the puzzle might seem a bit hard at first, but if you separate the pieces into groups, it gets easier. You can start by excluding the two pieces that have a semi-sphere on each side and knowing also that orientation-wise, you can't place at the bottom a semi-sphere or a two-indentation piece facing down, you're left with fewer options. The rest might be solvable with a bit of trial and error, but do this by phases, meaning that if you can't fit the last three or four pieces, don't start over from the bottom, but instead replace a couple of pieces from the middle layers and work your way up from there. Now, it gets a bit trickier. The fourth box is a level *** - Unbelievable, but if you managed to solve the previous three, it shouldn't be that hard. 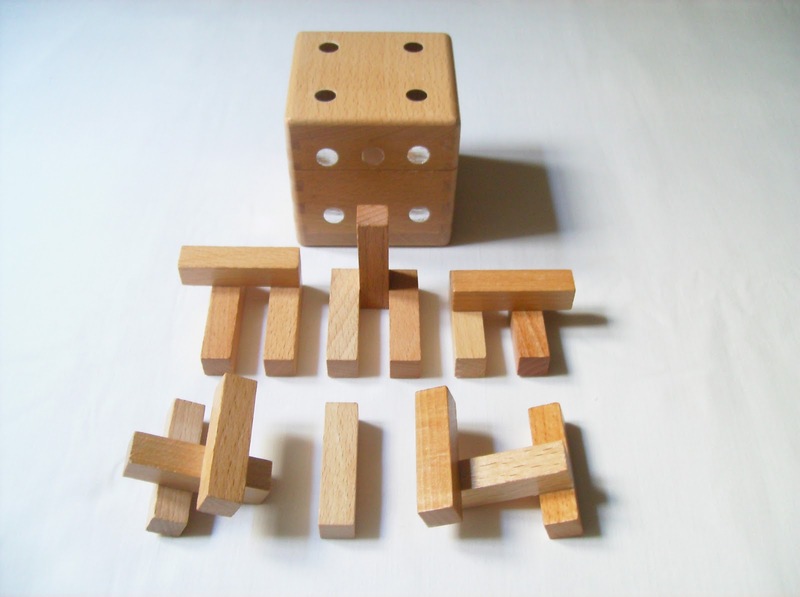 There's a total of sixteen sticks making a 4x4 cube, but the twist is that they're glued together in five different pieces with very odd shapes made with three sticks each, plus one loose stick. I recommend saving the single stick for last, because if you try to use it earlier it will only add complexity instead of simplifying the puzzle. 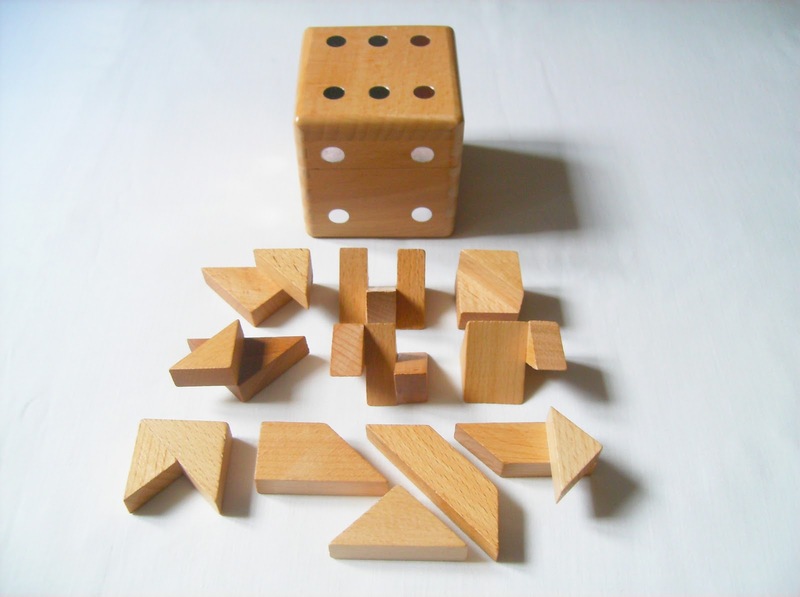 The difficulty in the puzzle lies in the many different possibilities you have to connect the pieces, due to their shapes. 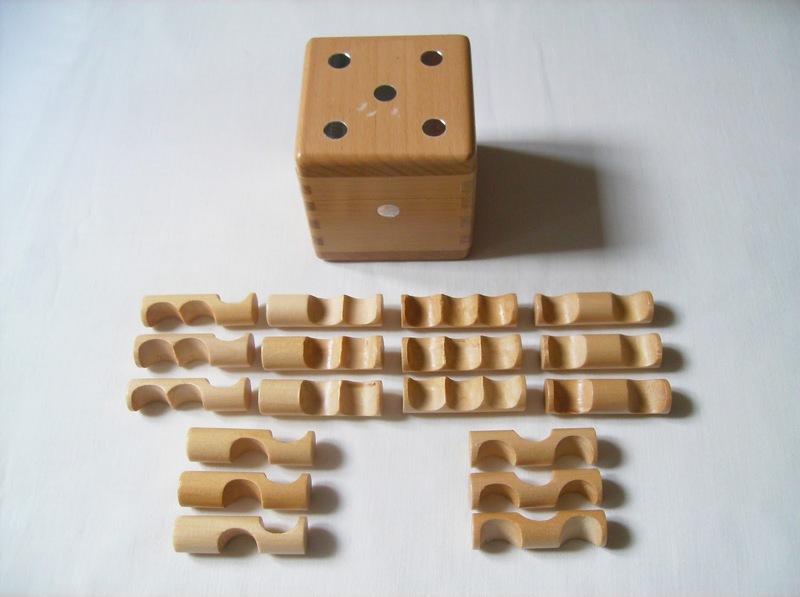 The Rod by Rod Box is also the same difficulty as the previous one, but like the first three, I think there's a slight higher level of complexity, mainly because of the number of pieces involved. 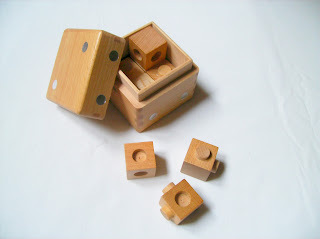 Actually, from the six puzzles, this box is the one with most pieces, with a total of eighteen. They're divided into six groups with three identical rods each, and every single one is carved with two or three indentations that can be on the top or bottom. Solving the puzzle is like building a raft with logs. You need to match perfectly every rod into the indentations of the other ones below, in a six layer cube with three pieces each. Sounds tough, right? That's because it is... Starting isn't hard, all you need to do is to put on the box three rods to make the first layer. For that you need three pieces that don't have indentations on the bottom, so that it doesn't leave gaps. Knowing that only half of the pieces meet that criteria, you can put the other half aside for now. After that, you just need to continue building your "raft", always taking into account what pieces you have left, because they will determine how you place them on the box. As previously noted in the Holes & Balls description, if you get stuck in the last couple of layers of the puzzle, don't start from the beginning again, just remove a few rods and replace them by other pieces, as most of the times, half of the puzzle is already solved. As we got from puzzle box 1 to 6, the difficulty was also increasing, so as you can imagine this is the hardest one, with ****. 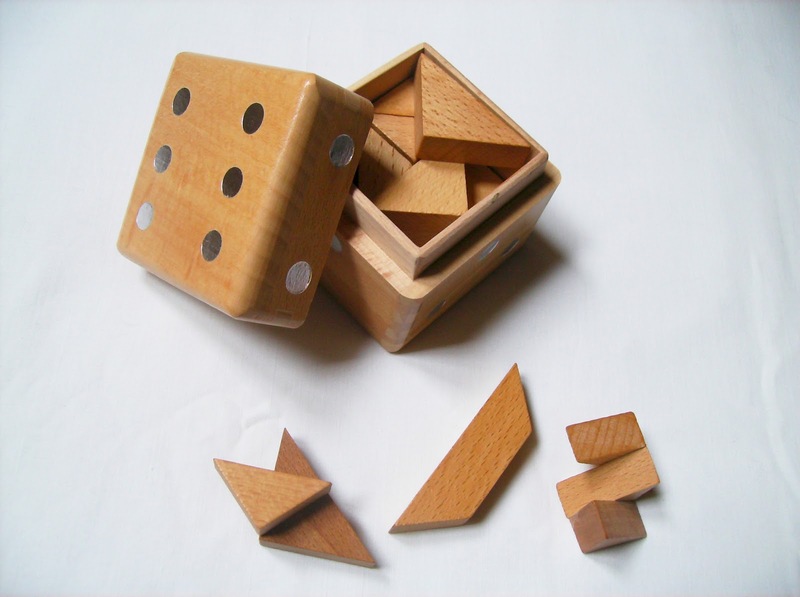 The puzzle has eleven pieces, all different from each other and with the exception of one piece, they're possible combinations of three smaller unit right triangles. The other piece has just an area of two unit triangles. 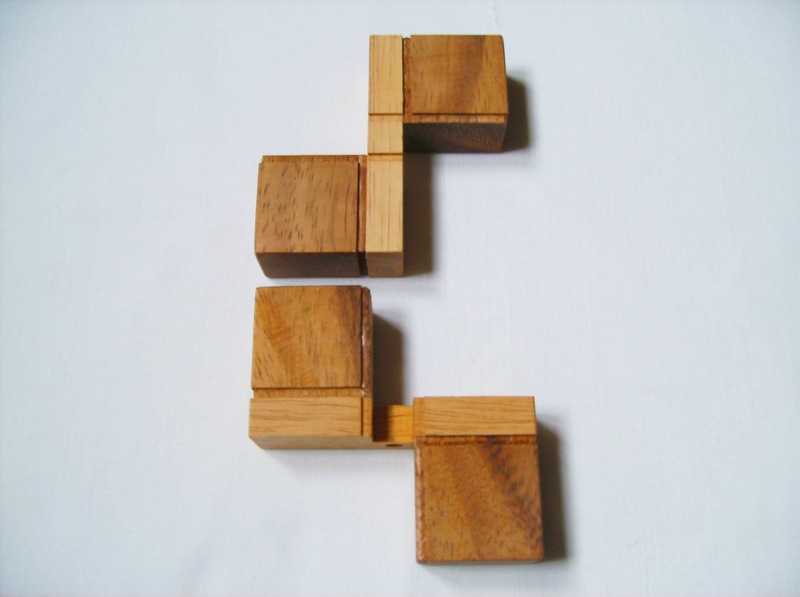 The goal, as the other ones, is to rearrange all the pieces so that they form a cube. 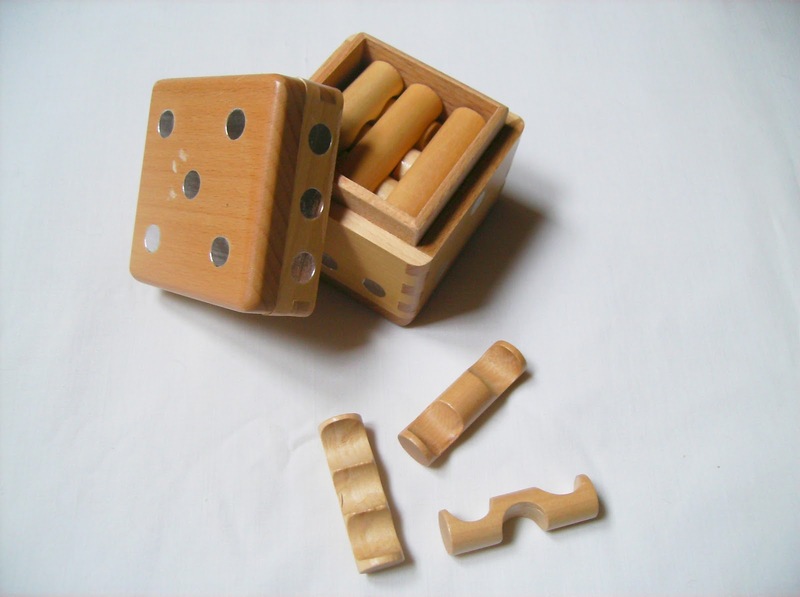 It can also be related to the Soma Cube, except the Soma Cube is made from only seven different pieces, and I believe it is also easier because of that, as less pieces means less possible combinations. Solving this one was a pain. The pieces have all these strange configurations and manage to connect them can be a bit frustrating. There's four flat pieces and the rest are glued in the other shapes, so I recommend to start with the last ones and leave the flats to the final stage of assembly. It took me a while to solve it, but on the last try I made it in around 5 minutes. The trick is nothing of extraordinary... When you see yourself taking more than half an hour with no results, leave the puzzle for a few hours or maybe a day or two, and when you return, you're going to have a fresher perspective on how to tackle the problem. This also applies to every other difficult puzzle you're having trouble with, because the mind always thinks clearer when it have rested. After solving the six Dice Boxes, I can highly recommend them to anyone, especially to the puzzle collectors. The set is a great addition to any collection, even if you're not that into Assembly puzzles, because its appearance and presentation stands out for the designers originality and creativity in creating something unique. I think that the difficulty rating should've been made differently, though. If I had to order them from the easiest to the hardest, I'd say (in box numbers): 2-1-3-4-5-6 or actually use a rating system from * to *****, to better differentiate the puzzles, as three levels seems not enough. In this way I'd classify them as (from #1 to #6) *, **, ***, ***, ****, *****. If you're interested in purchase the set or just one, there are a few places you can get them. Unless you want to buy them as wholesale, the MI-Toys website isn't an option. 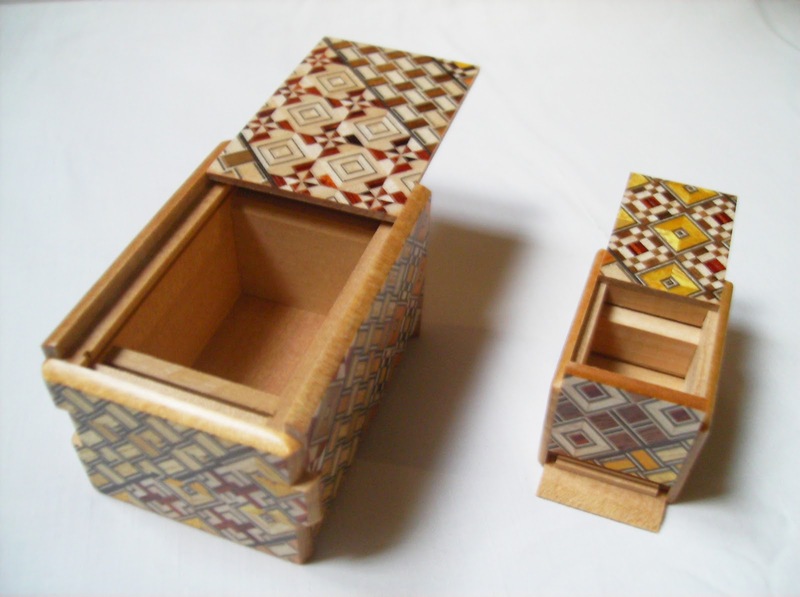 If you search on eBay for "Dice Box" and select the subcategory "Jigsaws & Puzzles", there's currently a couple of sellers that have them in stock, although just one of them has the complete set. You can also take a look at Amazon or SeriousPuzzles, both of them have the complete set also. PuzzleMaster has a few available as well. If you're like me and live in Portugal, you can order them from the "Papagaio sem Penas" store.